The default shopping experience of both Magento 1 and Magento 2 is great, but there is still room for improvement. So, you can easily make your ecommerce storefront better with the help of the Magento 2 Quick View extension by Amasty. 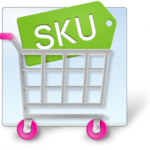 After installing the module, you will provide your visitors with the ability to make purchase decisions much faster. How? Quick View essentially simplifies catalog browsing with a handy preview window that displays product details. Consequently, your customers can instantly find necessary product data and add items to cart without checking a product page. Now, let’s describe the module in more details. The first thing we’d like to draw your attention to is highly configurable settings that allow you to customize the ‘Quick View’ button display according to your needs. 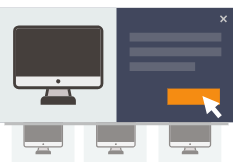 The extension provides the ability to specify a background color, as well as button position, size, text, and more. The informative product preview window eliminates the necessity to load numerous product pages for getting additional information about desired items. Everything is displayed in a handy popup window on a category page. The window contains product images; both short and detailed descriptions; stock status and price; and even reviews along with some additional data. As for available options, the Magento 2 Quick View extension lets your customers not only add items to cart but perform other actions available on a real product page. For instance, they can add products to comparison list in just one click. Besides, the quick view window allows sending emails. Another great opportunity is related to writing product reviews. Looks promising, so let’s dive deep into the extension’s backend and explore its appearance on the frontend. 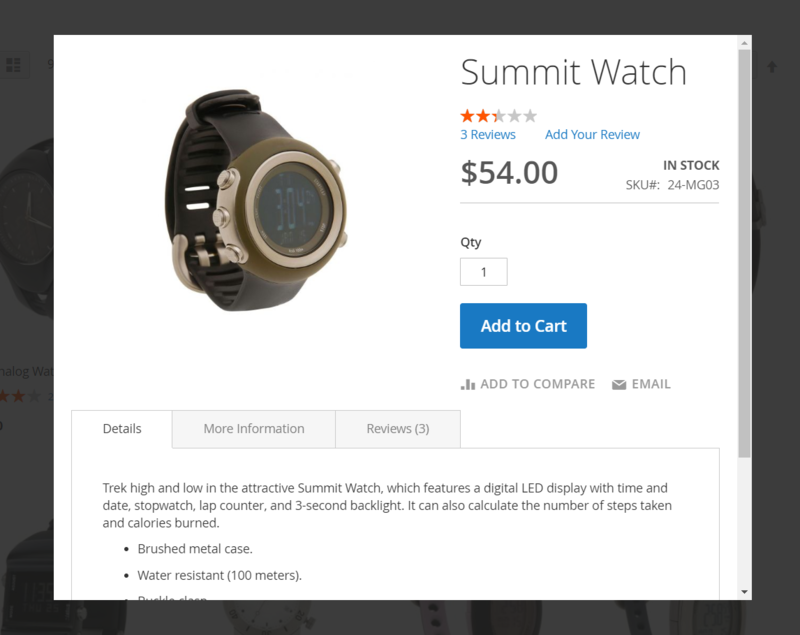 When on a category page, hover over a product image, and you will see the quick view button. 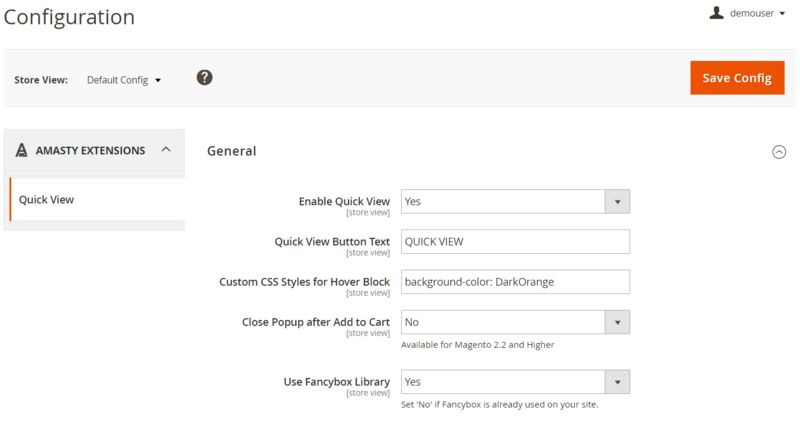 Hit the button, and the Magento 2 quick view extension will display a popup window. As you can see, it contains all the described above information. 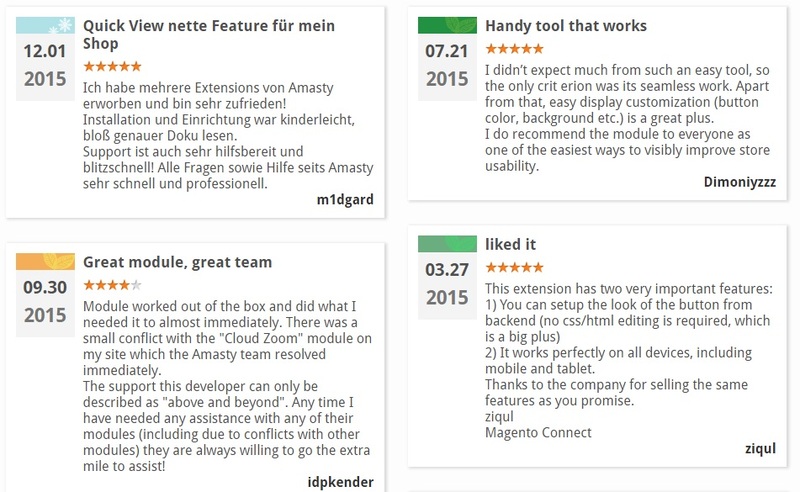 Amasty Magento 2 Quick View extension seems to be on of the most straightforward extensions in the whole Magento ecosystem, but it does an excellent job. By introducing the mentioned above improvements, it significantly enhances the default customer experience. Note that M2 module costs $129, while the appropriate M1 extension is just $69.